The term small and medium-sized enterprises (abbreviation SME) or small and medium-sized businesses (abbreviation SMB) is a size-dependent distinction between large companies and small organisations. The target segment’s defining characteristics include the number of employees, sales and total assets. Certain boundaries for these given characteristics are defined, and those companies crossing the boundaries are no longer considered SMEs or SMBs. It’s important to note that this classification is not based on the chosen legal form or ownership structure. SMEs are flexible, responsive and customer-focused. They are however also more prone to succession problems and financing bottlenecks than larger companies. SME and SMBs legal categorisation is thus particularly important in order to obtain certain state and EU funds. Other characteristics often include their one man show of innovative activity and low degree of formalisation. Often you will find your target buyer persona to be the the unification of the entrepreneur, the investor and the operations manager in one person. SMEs and SMBs are known for their flat hierarchies, personal contact between employees and entrepreneurs aswell as proximity to their customer segments. 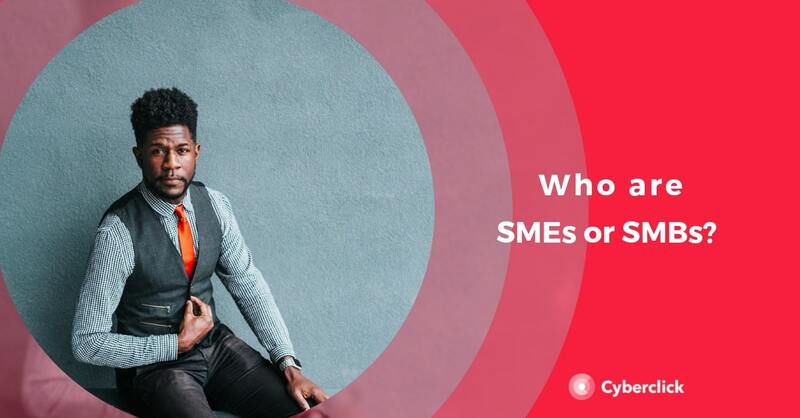 As previously mentioned, categorisation SMEs and SMBs using their unique characteristics is highly relevant and important for their financing abilities. For firms whose target market segment is SMEs and SMBs these characteristics are difficult to measure. How do we know whether we are targeting SMEs and SMBs? Quantitative characteristics are used to distinguish these smaller from large companies. The clear cut criteria of turnover, number of employees and balance sheet total play a role here. Target market segment- Micro-enterprises. Micro-enterprises are companies that have less than 10 employees and have an annual turnover or an annual balance sheet total of no more than € 2 million. Target market segment- Small enterprises. Small companies are companies with less than 50 employees and have an annual turnover or an annua lbalance sheet total of no more than € 10 million. Target market segment- Medium-sized enterprises. Medium-sized companies are companies with less than 250 employees and have an annual turnover not exceeding €50 million or an annual balance sheet total not exceeding € 43 million. Depending on the size of the businesses, various solution offerings will be relevant to the specific target market. 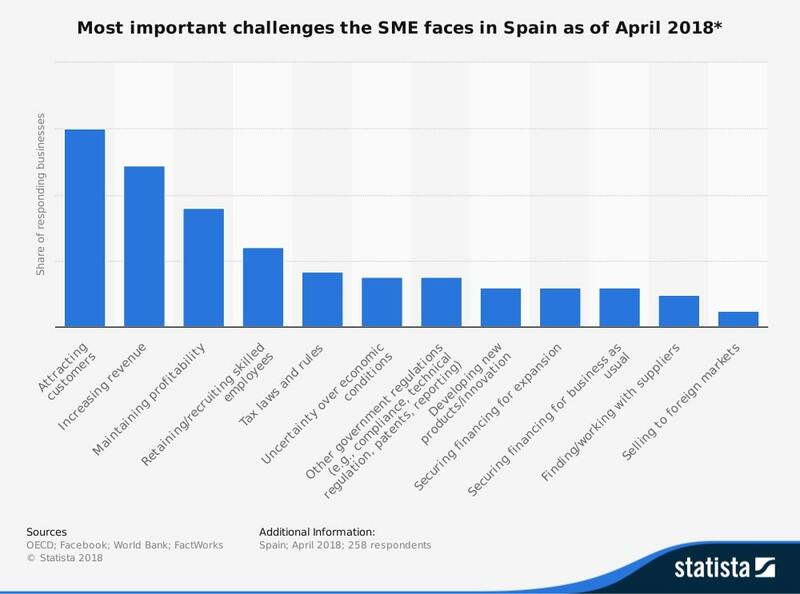 To better understand how you can bring your target market segment the most relevant and specific solutions, understand most important challenges the SME faced in Spain from Statista’s data. To make the graph simpler, we’ve taken 2 points of reference for clarification. 87 percent stated that their most important challenge was attracting new customers and 28 percent the uncertainty over the economic conditions to be a challenge. From the graphic one could draw the potential for winning SME customers with innovative training services for their businesses. Due to rapid technological and demographic change, the strategic importance of investments in further training from SMEs and SMBs will continue to increase in the future. Efficient and effective investments in further development and training services are therefore a competitive factor, especially for the 30% of SMEs and SMBs struggling to retain and recruit skilled employees. SMEs face lack of time, financial limits and staff shortages. Firms that are providers of innovative training services, targeting SMEs and SMBs, face one major challenge: SMEs only invest in the trainings if the providers succeed in providing services that take into account their special needs and requirements as well as scarce resources. SMEs expect training providers to provide support in the form of advice, flexibility, proximity, cost-effectiveness, innovation -and a little motivation. In order to attract the SME and SMB target market segment it is thus essential to integrate highly relevant and specific offers. When designing your digital marketing strategy for your online target market segment of SMEs and SMBs, ensure to integrate native advertising and content marketing. These two methods are non intrusive ways to get close to their consumers and drive conversion, and if you're interested we've compared the two strategies here. Firms that are operating with the SME and SMB target market segment such as PaySimple (providing credit card readers to small merchants) and Hubspot (providing marketing and sales software) have extensive blogs. This way their target market segment is addressed from the moment they even think about purchasing a good or service as they consult google for advice. This type of marketing will ensure not to scare away this highly specific and sensitive target group. As opposed to more traditional and intrusive native ads and content marketing strive to create advertising that users actually want to see.